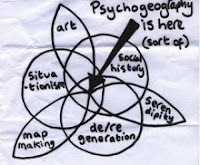 PSYCHOGEOGRAPHY: mention that to most people and they’ll probably look at you blankly. But a Manchester psychogeographic group offers monthly tours as an alternative to official, Blue Badge guides to the city. The Loiterers Resistance Movement, a collective of urban explorers “loitering with intent to make Manchester wonderful”, is probably Manchester’s only local history and walking group watched over by the Greek goddess of chaos, Eris, and influenced by the flâneur, a dandy-esque Victorian figure who wandered the city as a detached observer. Founder Morag Rose complains “modern society is so rigid”. Chaos, on the other hand, “can be a creative force”.Morag explains, “chaos is thought of as scary, but it can be beautiful”. In a manifesto-esque statement of intent on the internet, The LRM lists its likes and dislikes: “plants growing out of the side of buildings” are good, “gentrification” is bad. The L RM celebrates the “colourful and diverse”. The movement was born late in 2005, out of the Basement on Lever Street, an anarchist meeting place. It has close links with other Manchester groups such as No Borders, which defends the rights of immigrants and refugees. 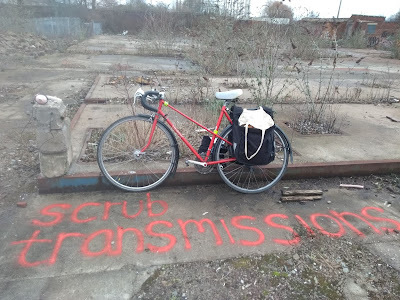 Although even most psychogeographers can’t agree what it means, psychogeography has its origins in the Situationist Movement, and the Paris Riots of 1968. The situationists were concerned with how we relate to and interact with the city emotionally, and how we can disrupt it. They encouraged debate about who is included and excluded in a city, and who can change it. Psychogeography is a world-wide activity - there is an Australian branch of The LRM, and it also has links to Germany and Belgium. Psychogeographers dispute the ownership of the city: “the city is made up of a million different stories, and the official history is just one of them”, explains Morag. The city is a public space with the potential for public revolution and change. Loitering, therefore, is a form of political protest. What does this have to do with modern Manchester? Late Manchester music mogul Tony Wilson was influenced by situationism, and hosted a Situationist International conference at the Hacienda in 1996. Today, psychogeography is a way of making sure that “the spiritual history of the city” and its “mythical undercurrent”, isn’t forgotten. The LRM is about dark alleyways and going through doors you’re not supposed to. It’s about serendipity: unearthing the hidden treasures beneath the streets and the forgotten ghosts lurking in those dark alleyways you’re too scared to go down. It’s about social history and the way in which the city’s past residents, such as Friedrich Engels and the mathematician and astrologer John Dee, live on, in places like Chetham’s library. It’s about finding the courage to visit “places never been before but you’ve always really wanted to, or the places you’ve been too scared to go to”. Mainly, though, The LRM recommends setting off on a walk where you don’t know where you’re going. The best way to find out more about the city, recommends Morag, is to“stop and look at things, talk to people and ask loads of questions” - like many of us, Morag admits that one of her main motivations is that she’s “really nosy”! Don't be put off by all the theory, though - Morag says, “it’s nice to get people along who haven’t really thought about psychogeography”. Whereas the Situationists were often “contradictory” and “used words no-one could understand”, the LRM is open to everybody. Although the LRM took part in the TRIP (Territories Reimagined: International Perspectives) conference at Metropolitan University in June, Morag stresses that the LRM is “community based – not academic”. The LRM is an antidote to a city which is “becoming more and more commercial and alienating for people”. Modern life, says Morag, is “stopping people being to engage with what’s around them”. Morag offers the Free Trade Hall as a particular place that alienates people: “it’s an expensive hotel with an oriental theme, when there could be so much heritage to celebrate there”. Morag adds, “We’re really busy - the whole city is rushing around. People go to work in a job they hate. It’s sad that life revolves around commerce and money”. If people looked around them, and got rid of their preconceptions, they’d realize that “there’s always more to explore and discover - when you’re looking, you see signs”. Furthermore, Morag thinks “It’s a shame that regeneration policies centre around shopping”. “People should play and have fun, not just go shopping”. The trouble is sometimes, finding a peaceful or quiet space where that’s possible. The LRM aims to restore the balance. Although Morag acknowledges it’s “good that cities are always changing”, she bemoans the fact that “regeneration often gets rid of the interesting things”. She stresses that the movement isn’t “anti-progress”, however. They don’t want to “go back to some kind of golden age”. We should just be thinking about what it is that makes Manchester Manchester. The LRM sets out to reclaim Manchester, whilst having a lot of fun and “giving people a good time” along the way. As Morag observes, “everyone loves Manchester for a different reason”, and has “their own sense of history and own stories”. Past dérives have included a pigeon’s eye view of the city that celebrated the oft-maligned creatures, a stroll based around the ‘lost rivers’ of Manchester, and night time walks. Morag is delighted when people bring stories with them. Old ladies who went along on the tour of fast-changing Ancoats shared anecdotes like memories of the canals turning frothy with soap from laundry, and reminisced about being threatened with the prospect of a monster called Jenny Greenteeth. Dérives often throw up myths and legends, such as that of the ice maiden in Salford who became pregnant at a time when it wasn’t socially acceptable and killed herself by jumping off a bridge. She got stuck in ice and people went to look at her. Morag says that this story is probably “half-myth, half fact”. The LRM may itself have created a few urban myths during its existence. Morag also offers intriguing titbits about Lincoln Square, ‘Umbrella Alley’, just off St. Ann’s Square, and antiquated laws relating to the walking of cows to the city from the outskirts. One walk took in masonic and sacred architecture, looking at some of Manchester’s most famous buildings, such as the seven-tiered town hall. The LRM also educated walkers about how the Royal Exchange theatre, ‘the biggest room in the world’, was built on different religious ideas using Kabalistic and Rosicrucian dimensions. A caduceus walk explored the origins of the serpentine symbol, which used to be the symbol of medicine, and is seen on lots of banks. September’s wander was based around CCTV cameras, and considered how being under constant surveillance affects our perception of the city - should we perform for the camera? Walks start in landmarks such as the John Rylands library, and usually end up in pubs like the British Protection, often taking place on historical date such as May Day and the Winter Solstice. Morag “never comes away without learning something” on one of her walks – “there’s never a wasted day”. Morag hopes in the future to do a 'Manchester music tour'. She asks, “who decided Manchester music was all about bands like Oasis, lad bands? What about Manchester’s folk tradition?”. Morag concludes, “look around you and there’s magic”. Even in the Mancunian rain! They both played as big bands, but strength in numbers was where the similarlities between Tindersticks and support Sara Lowes ended. Lowes, a Manchester singer-songwriter, conjured retro, slightly sixties songs that were closer to smooth LA pop than the dark musical heritage of her home town. Her pleasant vocals were tinged with the humour of Fiery Furnaces’ Eleanor Friedberger. Tindersticks, however, are autumn personified, a distillation of that bittersweet end of summer feeling - the realisation that it’s really over and won’t come back. Like all rich things, their music is best enjoyed in moderation, often as a concoction administered at the end of a relationship. They’re the aural equivalent of getting your coat, scarf and gloves back out, tucking into shepherd’s pie and settling down inside as the nights get longer. Putting Tindesticks on is as comforting as wrapping up in your favourite old jumper. Fittingly for a band who create film soundtracks, Tindersticks took to the stage one by one like a roll call of characters listed in order of appearance. A sedate tableau emerged from the darkness, with only one vital ingredient missing: Stuart Staples’ extraordinary voice. Staples was stuck to the microphone as if by magnetism, eyes closed, for most of the set as if he was straining to hear the dramas that were carried out in the whispers of his own voice. He was spotlighted at times, but the extra attention was unnecessary; his voice is its own spotlight that dazzles everything around it. When Staples, hitherto grey haired and grave in a grey jacket, came back beaming after the encore, it was akin to Gordon Brown getting up and doing a dance in the middle of parliament. Like the best movies, Tindersticks were engrossing yet offered moments of excitement. An instrumental with a bassline straight out of The Shadows was accompanied by spotlights sweeping across the stage like the start credits to a James Bond film.